We offer a Metal Spraying service using a number of Sulzer Metco12E (Wire fed) guns and Sulzer Metco 5P mk11 (powder fed) guns. A wide range of coatings can be applied including high carbon steel right through to stainless steel, copper, bonze, aluminium, molybdenum and lead based materials. Applications are almost endless, but a few examples include seal diameters, machine spindles, bearing surfaces & print rollers. Fast Turnaround: Because metal spraying can be a fairly fast operation turn around times can be greatly reduced when to compared to electroplating (i.e. our hard chroming process). This is particularly useful for emergency services such as spindle repair on machine breakdowns. Metal spraying is also useful for repairing work that has been machined incorrectly or has been unexpectedly damaged. Thick coatings can be built up and subsequently ground back to tolerance required. 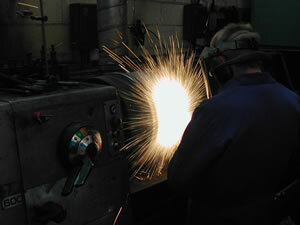 The flame spraying process uses a heat source of oxygen and acetylene. The material to be applied is fed into the flame in the form of a wire then compressed air is used to atomise the molten metal and accelerate the particle to the substrate. all spray materials can be manufactured in wire form. Pre-treatment: Surface adhesion is purely mechanical and as such, a solid key is required, free of grease or other contaminants. Therefore the careful cleaning and pre-treatment of the surface to be coated is extremely important. Surface roughening usually takes place via grit blasting with dry corundum. In addition, other media, such as chilled iron, steel grit or SiC are used for some applications. All items are grit blasted with sharp abrasive grit to achieve a surface roughness of approximately 100-300µin. Besides the type of grit, other important factors include particle size, particle shape, blast angle, pressure and purity of the grit media. Suitable substrate materials are those that can withstand blasting procedures to roughen the surface, generally having a surface hardness of about 55 Rockwell C or lower. Special processing techniques are required to prepare substrates with a higher hardness. Aluminium coatings provide protection against corrosive atmospheric environments. Aluminium silicon coatings are used for repair and restoration of aluminium based substrates and for low temperature seal applications in compressors. The addition of silicon in the aluminium alloy provides improved machining capability over coatings of pure aluminium. Coatings of pure copper provide good conductivity for electrical applications. Copper alloy coatings are used for machine element work, salvage, repair and restoration of copper based substrates. Carbon and low alloy steel appropriate for general-purpose wear applications are available. The various grades with differing carbon content effect coating hardness and wear resistance. Stainless steel alloys are also readily available. All of these products are appropriate for general restoration, salvage and build-up of worn and mis-machined components, with harder alloys providing additional wear resistance. Lead based coatings (equivalent to white metal) provide a self-lubricating bearing surface and exhibit good resistance to acids and other strong reagents. Ideal suitability includes adjustable bearing shoes in machine tools. Molybdenum coatings produce hard, lubricious surfaces that are resistant to abrasion, galling and scuffing and exhibit a very low coefficient of friction. These characteristics are the result of molybdenum oxide formation on the surface. Key applications for this material are for automotive and other transportation equipment components.